I have a schedule… and the schedule tells me how late my night’s going to be. By 7:00 pm, I’m writing my strip. Might not take an hour if I already have dialog in mind, but most nights, It’s about half an hour. If I’m not writing by 7, there’s some worry starting to appear. By 8:00 pm, I’m sketching my strip. This is the step where I pencil in what is going to be on the strip visually. Characters, props, and backgrounds. This takes the longest time to do because I’m laying out each panel and trying to get my characters and visuals to gel. My hope is to start this step before 8. If I’m not sketching by 8, panic is setting in. By 9:00 pm, I’m inking what I hope is some good blue line sketching. After 3 years, I’ve got this down to a science and can bust this out pretty fast depending on the size of the strip. If i’m not inking by 9, crippling fear is creeping in. By 10, I should be coloring the strip. Hopefully long before 10. This takes while because I’m also adding shadows and backgrounds. If I’m not color by 10, it’s going to be a long night. So what’s this mean? By 9 pm last night, I hadn’t even written today’s strip. Which means all is lost. Rather than force a quick and dirty crappy strip in a short amount of time, I will post today’s strip on Thursday Friday. 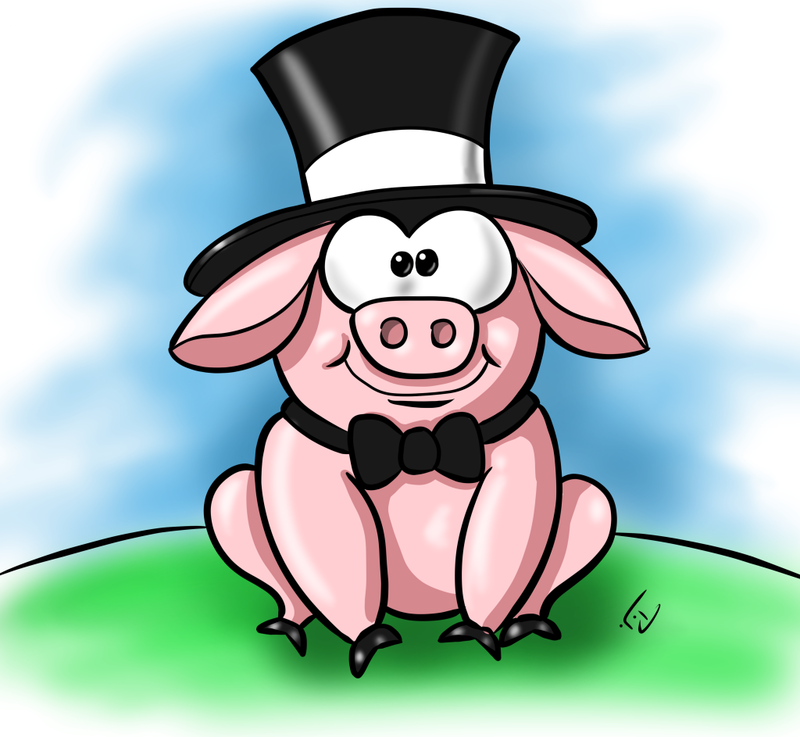 In the meantime, to tide you over til then, enjoy this fancy pig in a top hat and bow tie. Squee!!! I LOVE FANCY PIG!!!! I know you do. LOL. OMG, the pig. I must have the pig. In all his piggity glory. Squeeeeeeeal! You gotta be able to catch him first. I work without a net most times.